This is “Australia”, section 12.2 from the book Regional Geography of the World: Globalization, People, and Places (v. 1.0). For details on it (including licensing), click here. Summarize the colonial exploitation and development of Australia. Understand the basic characteristics of Australia’s physical geography. Outline how the core-periphery spatial relationship applies to Australia. Describe the country’s general cultural attributes. Summarize the methods used for the country to gain national wealth. There is an international attraction to the island continent of Australia, and the attraction has grown in intensity in the past few decades. Tourism is now the number one economic activity in Australia. Just slightly smaller in physical area than the continental United States, Australia is a large country with many resources but few people relative to its size. The Tropic of Capricorn runs right through the middle of this country. Australia hosts many unique species of plants and animals, including marsupials and a host of poisonous snakes and insects. With the advent of European colonialism, new species were introduced to the country, which regrettably caused the extinction of some of the native species but also gave Australia a wide diversity of organisms and natural conditions. Australia is a relatively low-lying island with low relief. It is the flattest of all the continents. The various highland ranges are pronounced, but are not high in elevation. The Great Dividing Range is a mountain chain extending from Melbourne in the south to Cape York in the north. This low-lying range of highlands averages about four thousand feet and reaches an elevation of just over seven thousand feet at its highest peaks in the south. The largest river in Australia is the Darling-Murray River system that starts in the highland of the Great Dividing Range and flows inward through New South Wales, Queensland, Victoria, and South Australia. The great interior of the country is home to the massive outback. Extending west from the Great Dividing Range, the outback encompasses most of the interior. This region receives less rainfall than along the coast and its terrain consists of deserts and semiarid plateaus with rough grasses and scrublands. The outback is sparsely populated, but is home to a number of aboriginal groups. Many of the school-age children in the outback have traditionally received their school lessons through television or radio broadcasts because of their isolation. 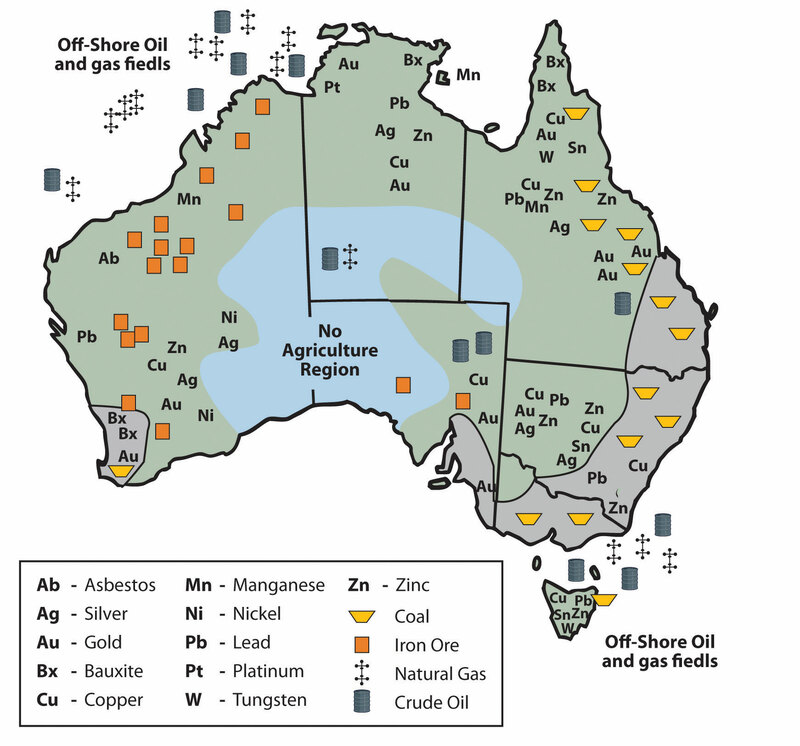 Mining and some agricultural activities can be found in the outback. Alice Springs is located in the center of the continent and has been given the designation of the middle of nowhere, or the center of everything. 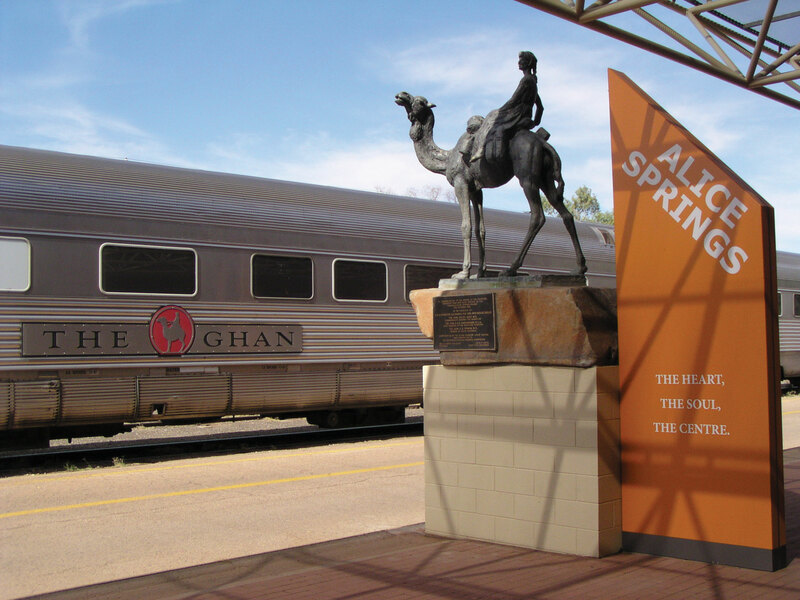 The remote town of Alice Springs is located at the center of the Australian outback. Source: Photo courtesy of Mike Young, http://commons.wikimedia.org/wiki/File:Ghan_at_Alice_Springs.jpg. The deserts of Australia’s interior make up a large portion of the continent. Western Australia has three large deserts: the Gibson Desert, Great Victoria Desert, and Great Sandy Desert. The Simpson Desert is located in the border region between the Northern Territory, Queensland, and South Australia. These deserts are not all sand; course grasses and various species of spinifex, a short plant that grows in sandy soil, also grow in the deserts. The Great Artesian Basin on the western edge of the Great Dividing Range receives very little rainfall. It would be classified as a desert but for its underground water resources, which support extensive farming operations. Large livestock businesses exist in Australia’s interior with massive herds of cattle and sheep. The grassy plateaus and scrublands provide grazing for domesticated livestock and even wild camels. The Great Barrier Reef, the largest barrier reef in the world, extends for 1,600 miles off the northeastern coast of Australia. It is home to a host of sea creatures and fish that draw millions of tourists each year. The reef attracts scuba divers and water enthusiasts from around the world. The reef is a main tourism attraction and brings income to the Australian economy. The Great Barrier Reef has been designated as a United Nations World Heritage Site. Brisbane is located on the Gold Coast, which gets its name from the beautiful sandy beaches. The beaches attract an important tourism market for the country. The rock rises 1,142 feet above the outback and is 2.2 miles long. The site is sacred to the Aborigines and is a major tourist attraction. It is listed as a World Heritage Site. Source: Photo courtesy of Huntster, http://commons.wikimedia.org/wiki/File:Uluru_%28Helicopter_view%29-crop.jpg. A couple of large physical features of interest and significance to Australia are the two largest monoliths in the world. In western Australia, more than five hundred miles to the northeast of Perth, is Mt. Augustus National Park, which features the rock known as Mt. Augustus. It is considered to be the largest single rock in the world. Mt. Augustus rises 2,352 feet above the desert landscape. The single structure is about five miles long. Mt. Augustus is more than twice the size of the most famous Australian monolith of Uluru (Ayers Rock). Uluru is located about two hundred miles southwest of Alice Springs in the Northern Territory and is a well-known tourist attraction. Uluru rises 1,142 feet above the outback and is about 2.2 miles long. Both rocks hold significant cultural value to the aboriginal populations in Australia. They both have ancient petroglyphs, and both are considered sacred sites. Uluru has been more popularized through tourism promotions. Central and western Australia are sparsely populated. Large areas of the Northern Territory and the desert regions are uninhabited. Approximately 40 percent of Australia’s interior is desert, where Type B climates dominate. The large land mass can heat up during the summer months, triggering high temperatures. Low humidity allows heat to escape into the atmosphere after the sun goes down, so there is wide temperature variation between day and night. Along the northern coastal region there are more tropical Type A climates. Closer to the equator and with the sea to moderate temperatures, the northern areas around Darwin and Cape York have little temperature variation. Temperatures in Darwin average about 90 °F in the summer and 86 °F in the winter. Spring monsoons bring additional rainfall from February to March. Tasmania, Victoria, and the core region of the southeast have a more moderate and temperate Type C climate. The main cities, such as Sydney, Melbourne, and Adelaide, are within this area. It is not surprising that there is a direct correlation between Type C climates and the major population areas. The Tropic of Capricorn cuts across the continent, indicating that the cities are not that far south of the tropics. Average winter temperatures in June and July do not usually fall below 50 °F and average summer temperatures in January and February remain around 70 °F. Since the seasons are reversed from that of the Northern Hemisphere, many Australians go to the beach for Christmas. The two core areas, where most of Australia’s population resides, are also noted. Not unexpectedly, the core areas have a dominant type C climate, following the general principle that humans gravitate toward type C climates. Source: Updated from map courtesy of Golbez, http://commons.wikimedia.org/wiki/File:Australia_states_blank.png. 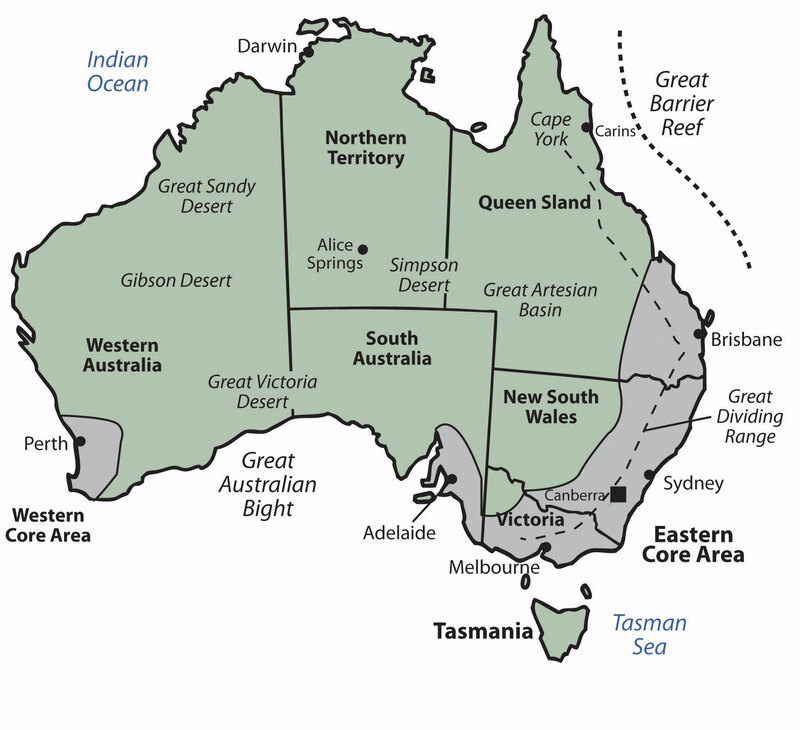 Australia is divided politically into six states and two territories. They are the Northern Territory, Australian Capital Territory, Western Australia, Tasmania, South Australia, Queensland, and New South Wales. Australian protectorates are composed of a number of small islands around Australia. Australian core areas are conducive to large human populations. To locate the core population areas in Australia, simply find the moderate Type C climates. Australia has two core regions. There is a small core region in the west, anchored by the city of Perth. Most of Australia’s people live in the large core region in the east along the coast. This region extends from Brisbane to Adelaide and holds most of the country’s population. The total population of Australia in 2010 was only about twenty-two million. There are more people living in Mexico City than in all of Australia. More than 90 percent of this population has European heritage; most of this percentage is from the British Isles. English is the dominant language. Christianity is the dominant religion of choice. The makeup of the people is a product of European colonialism and immigration. Only about 2 percent of the current population consists of Aboriginal people, the original people of Australia. Australia’s population has seen periodic growth spurts as waves of immigrants responded to national policies encouraging immigration. This was especially true after World War II. About 24 percent of the current population was born outside Australia; most come from the United Kingdom, and another large percentage comes from New Zealand. Asian countries have also contributed to the Australian population, with measurable numbers of immigrants from China, Vietnam, and the Philippines. And lastly, people from Italy and India also make up a notable proportion of Australia’s immigrant population. Australia’s population is not spread evenly across the landscape, since a large portion of the country is desert. The population is concentrated mostly in the urban areas. About 90 percent of the population inhabits the cities, which are mostly in coastal areas. The largest city, Sydney, is often referred to as the New York of Australia. 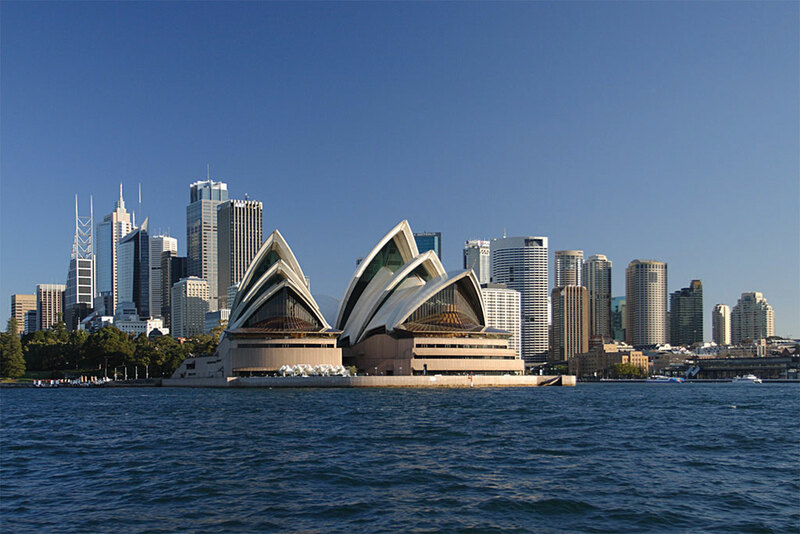 Sydney is positioned at the heart of the main core area, the state of New South Wales. To the south of Sydney is the Australian Capital Territory, home to the capital city of Canberra. Other major Australian cities include Melbourne, Perth, Adelaide, and Brisbane. Hobart is the largest city on the island of Tasmania and Darwin is the largest city in the Northern Territory. Source: Photo courtesy of Matthew Field, http://commons.wikimedia.org/wiki/File:Sydney_opera_house_and_skyline.jpg. All the large cities of Australia—with except the planned capital city of Canberra—are located on the coast. This pattern of urban distribution was a product of European colonial development. Most of Australia’s population lives in the two economic core regions, so Australia exhibits a distinct core-periphery spatial pattern. The core areas hold the power, wealth, and influence while the periphery region supplies all the food, raw materials, and goods needed in the core. Australia has never had a majority rural population since its Aboriginal times. There has been little rural-to-urban shift in Australia’s population. This is similar to Japan’s urban development pattern. English is the first language of the vast majority of the population. Recently enacted policies and changing attitudes toward multiculturalism have spurred growth in the number of immigrants and their descendants who speak two languages fluently—English and the language of their birthplace or national heritage. Indigenous languages have not fared so well. As many as three hundred indigenous languages were spoken by AboriginesPeople native to Australia when the European colonialists arrived. before the Europeans arrived, and just a few hundred years later, that number now stands at about seventy. Most aboriginal languages are in danger of dying out. Until 1973, Australia had a collection of laws and policies known as the White Australia policy, which served to limit the immigration of nonwhite persons to Australia. While the White Australia policies limited immigration from some areas, other policies sought to expand immigration from the United Kingdom. Subsidies were offered to British citizens to relocate to Australia. Between 1830 and 1940, more than a million British citizens took advantage of the offer. Recent census data indicate that about a quarter of the population identifies itself as Roman Catholic and another 20 percent self-identifies as Anglican (the national religion of the United Kingdom). An additional 20 percent self-identify as Protestant, other than Anglican, and about 15 percent as having no religion. Regular church attendance is claimed by at about 7.5 percent of the population. Despite modern Australia having been settled by the British, Australian law decrees that Australia will have no national religion and guarantees freedom of religion. Sports are an important part of Australian culture, perhaps owing to a climate that allows for year-round outdoor activity. About a fourth of the population is involved in some kind of organized sports team. Football (soccer) is popular, as is true in most European countries, and rugby and cricket are popular as well. The most popular spectator sport in Australia is Australian Rules Football, also known as Aussie Rules Football, or simply “footy.” This uniquely Australian game has codified rules that date back to 1858 and is a variant of football and rugby. Other forms of entertainment include television, film, and live performances of every kind. Although Australia has a number of its own television stations, there are concerns that popular culture is beginning to be dominated by American influences. Australia’s large cities have extensive programs in the arts. Sydney is becoming a center for world-class performances in dance, opera, music, and theatre. Education is well funded and internationally respected. School attendance is compulsory between the ages of six and fifteen, and the adult literacy rate has held steady at about 99 percent. Most students attend publicly funded schools, which are secular. Private schools, which charge tuition fees, do exist and are typically run by religious organizations, predominantly the Catholic Church. Most of Australia—especially the wide expanse of the arid interior known as the outback—has immense open spaces, agricultural potential or excellent resource extraction possibilities. The extensive grasslands support tens of millions of domesticated animals—mainly cattle and sheep—which accounts for up to one-fifth of the world’s wool production. Large agricultural businesses include thousands of acres under one operation. The western sector of the Great Dividing Range in New South Wales is an excellent region for commercial grain operations. The coastal region in Queensland, since it is warmer and receives more rainfall, is good for sugarcane and similar crops. Sheep and cattle ranches are common in central Queensland and Western Australia. Various regions of southern Australia are excellent for grape and fruit production. Australian wine production has risen to compete with the US and European markets. Only the dry central desert regions in the center of the continent are not favorable for agriculture. In the early portion of the twentieth century, Australia gained enormous wealth by exporting food products to the rest of the world. This is still true, but the profit margin on food goods is no longer what it used to be. The country has had to look elsewhere to gain wealth. 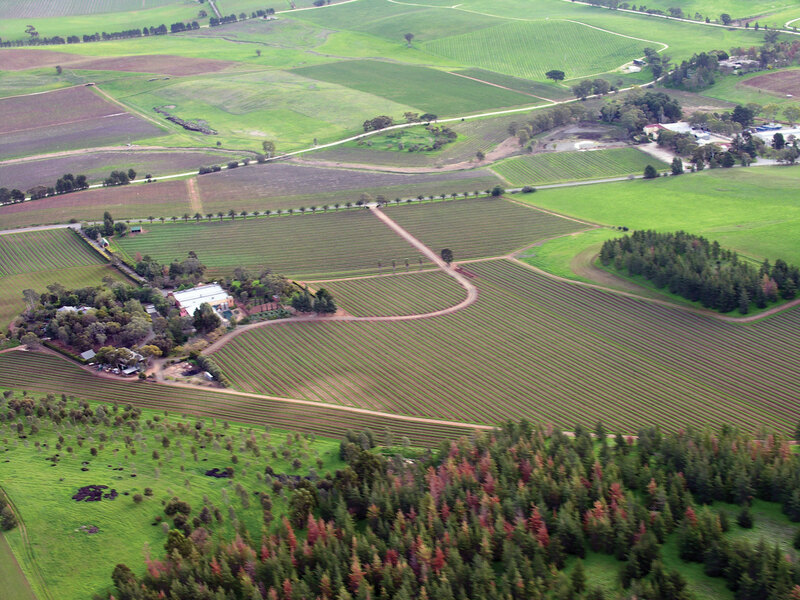 The agricultural region of the Barossa Valley in South Australia grows grapes and produces wine. Agricultural production is a major source of economic wealth for Australia even though only 11 percent of the population lives in rural areas. Australia’s wine production is expanding to compete in the global marketplace, with France and California as major competitors. Source: Photo courtesy of Louis Roving, http://commons.wikimedia.org/wiki/File:Barossa_Valley_South_Australia.jpg. Australia has excellent food production capabilities. It also has an excellent mineral resource base. Different types of minerals can be found in different regions throughout Australia. Western Australia has iron ore mines. The eastern region of Queensland and New South Wales has abundant coal reserves. Minerals such as zinc, copper, gold, silver, tungsten, and nickel can be found in various parts of the country, including Tasmania. Oil and gas fields can be found in the northwestern coastal waters and in the Tasman Sea east of Melbourne. The country is self-sufficient in natural gas but does have to import some petroleum products. Are any Australian-manufactured products available where you live? What products can you think of? Australia does not export many manufactured goods. Its main exports are food and raw materials. If you remember how countries gain wealth, the method with the highest valued-added profit is manufacturing. Think about Japan and the four Asian economic tigers, and how they have gained their wealth. The economic tigers have few raw materials. Where do you suppose the economic tigers and Japan get their raw materials? With Japan’s enormous manufacturing capacity, it has a high demand for imported iron ore, minerals, and raw materials. Though Australia is a former British colony, Great Britain is not considered Australia’s largest trading partner. Australia is closer geographically to the Asian economic community than to the European Union. Japan has become Australia’s biggest trading partner. When Australia is viewed in the news, in television programs, and in Hollywood movies, it is portrayed as a country with a similar standard of living to the United States or Europe. How do Australians have such a high standard of living if they don’t manufacture anything for export? To evaluate this, think about the size of the population of Australia and consider the distribution of wealth. They export an immense amount of raw materials and have a relatively small population to share the wealth. The Gold Coast of eastern Australia draws tourists from the Northern Hemisphere throughout the winter season. It is called the Gold Coast because of the long stretches of golden sand beaches, the golden tanned bodies of beach goers, and the high level of income (gold) derived from the tourism industry. 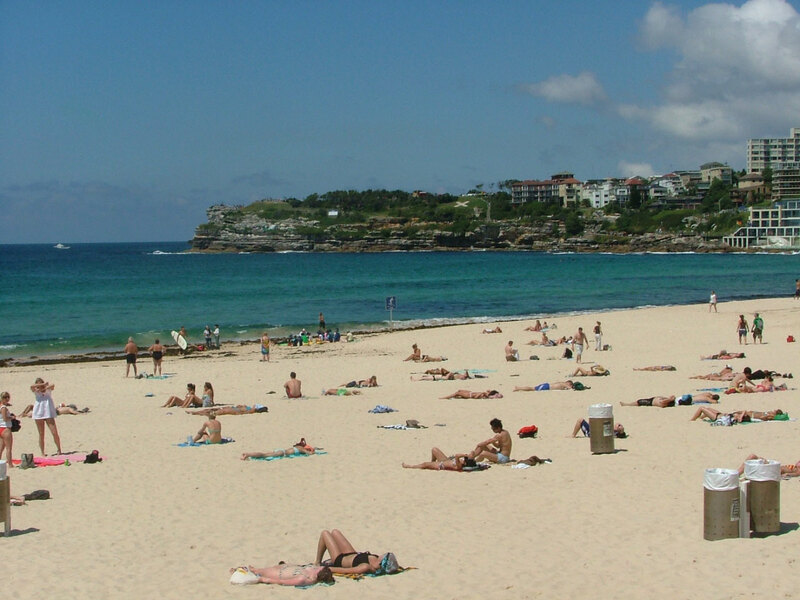 Source: Photo courtesy of Dingy, http://commons.wikimedia.org/wiki/File:Bondi_beach_en_novembre.JPG. Australia is an attractive place to visit. The environment, the animals, and the culture make it inviting for tourism. As of the year 2002, tourism has become Australia’s number one means of economic income. From the Great Barrier Reef and the Gold Coast to the vast expanse of the outback, Australia has been marketing itself as an attractive place to visit with great success. Tourism from Japan provides a large percentage of the tourist activity. Australia has moved through the initial stages of the index of economic development to become a society that is about 90 percent urban with small families and high incomes. Territorial control of Australian lands has become a major issue in recent years. Large portions of western Australia and the outback have traditionally been Aboriginal lands. European colonialism on the Australian continent displaced many of the native people. Large sections of land once used by the Aborigines were taken over by the government or by private interests. Large agricultural operations and mining operations have used the lands without adequate compensation to the Aboriginal people who once controlled them. Court rulings aimed at reparation for native people have had mixed results. There are as many as four hundred different groups of Aborigines currently in Australia that make up a total population of about four hundred fifty thousand. This is a small percentage of Australia’s population but involves a large part of the physical area of the country. Their land claims include all of the Northern Territory, a large portion of western Australia, and parts of South Australia and Queensland. This is in addition to claims located within many urban areas, such as the largest city, Sydney. Mining operations on Aboriginal lands have become highly regulated. Concerns have arisen that Australia’s extractive industries will diminish, causing a decline in the economy. The concern for the Aboriginal population has increased in the past few decades and the government has made attempts to mediate their political and economic issues as well as strengthen programs that address their social welfare. The economic future of Australia is complex. Though tourism has become a viable means of providing income, Australia must import manufactured products that it does not produce locally, including electronic goods, computers, and automobiles. Import dependence has increased its trade deficit. Trade agreements and protectionism have become a part of the economic puzzle of how to sustain a competitive standard of living. Australia is located next to the Asian realm. Its economy, culture, and future are becoming more Asian. Immigration has been an issue in that the government has always restricted immigration to ensure a European majority. Millions of Asian people would like to migrate to Australia to seek greater opportunities and advantages, but they are legally restricted. It is becoming more difficult for Australians to hold to their European connections with such an Asian presence. How the country will handle this situation in the future will prove interesting. Australia is an island continent that was home to aboriginal people before the British colonized it by first creating prison colonies for convicts from Great Britain. Australia is a relatively flat continent with low elevation highlands, including the Great Dividing Range along its eastern coast. The interior outback lacks precipitation and has numerous deserts. Two main core areas exist where Type C climates prevail and where most of the population lives: a large core area on the southeastern coast and a small core area around Perth on the western coast. The sparsely populated outback makes up the vast periphery, which has large amounts of mineral and agricultural resources. Aboriginal people were in Australia for forty thousand years. The British colonial activity didn’t heat up until the late 1700s. Today, most of the twenty-two million people are from the British Isles and Europe. Only about four hundred fifty thousand Aborigines remain. Australia has few manufacturing enterprises for export profits. Tourism has become the number one method of gaining wealth, with the export of raw materials the second-largest method. Name the European country that colonized Australia. What was the original reason for colonizing Australia? What are Australia’s main political divisions? What is the vast interior called? What are some of Australia’s main physical features? How are they developed for tourism? What are the main climate types in Australia? How does climate relate to population? What type of government does Australia have? What is its capital city? Who is head of state? Outline the core-periphery relationship in Australia. What distinguishes the core areas? How does Australia compare with the Asian economic tigers? How do they support each other? How does Australia maintain a high standard of living when it exports few manufactured products? What are Australia’s main exports? Who is their main trading partner? What stage is the country in with regard to the index of economic development?